Yukata and kimono are traditional Japanese clothing. Most of the people just know the names yukata and kimono, but hardly know the actual difference between the two. The basic difference that can be seen between yukata and kimono, is in their fabric. Well, yukata comes in cotton fabric. On the contrary, a kimono dress comes in silk fabric. Another difference that can be seen, is that yukata is worn during the summer season. They are also worn as bathrobes in places such as Hot Springs. Literally meaning, bathing clothes, yukata has been derived from ‘Yu’, which means bath, and ‘katabira’, which means under clothing. Literally meaning, a ‘thing to wear’, kimono has been derived from ‘Ki’, which means ‘wear’, and ‘mono’, which means ‘thing’. Unlike yuakata clothing, kimono clothing has at least two collars. Of the two collars, one sits close to the neck, and the other one is placed a bit lower, so that the two collars are seen distinctively. While using kimono, socks will have to be worn. It means that unique shoes, like zori or geta, will have to be worn with kimono clothing. Although, this is not mandatory while wearing a yukata dress. Both men and women normally wear kimono. On the other hand, yukata is worn more by women than men. In terms of cost, the kimono is more expensive than yukata. 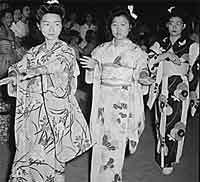 Moreover, one can see that the Kimono designs are very unique, and one will not come across two kimonos of the same type. Well, kimono is considered to be more a glamorous dress. On the other hand, yukata clothing is considered to be a simple garment. 1. Yukata comes in cotton fabric. On the contrary, a kimono dress comes in silk fabric. 2. Unlike yuakata clothing, kimono clothing has at least two collars. 3. Shoes like zori or geta will have to be worn with kimono clothing, but this is not mandatory while wearing a yukata dress. 4. Yukata is worn during the summer season. They are also worn as bathrobes in places such as Hot Springs. 5. Both men and women normally wear kimono. On the other hand, yukata is worn more by women than men. 6. In terms of cost, the kimono is more expensive than yukata. Prabhat S. "Difference Between Yukata and Kimono." DifferenceBetween.net. March 19, 2011 < http://www.differencebetween.net/miscellaneous/difference-between-yukata-and-kimono/ >. Actually a kimono doesn’t have to be made from silk. You need to relearn grammar, but great otherwise. Thanks for the help! Although a lot of points are mentioned in both posts. I guess kind of like the difference between a sun dress and an evening gown/cocktail dress.